The Masajid of Allah (swt) shall be visited and maintained by such as believe in Allah and the Last Day, who establish regular prayer, practice regular charity, and fear none except Allah. It is they who are expected to follow true guidance. 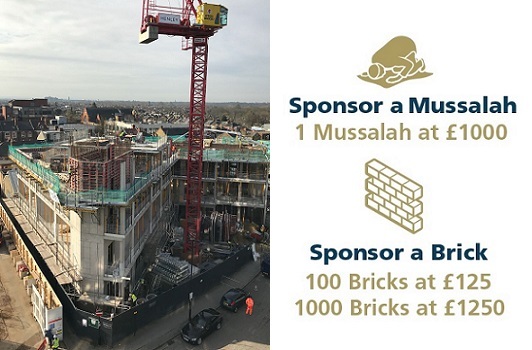 You can support the building of Allah’s House by sponsoring a Mussalah or bricks. Please donate wholeheartedly by sending cheques, completing the standing order form with a commitment of whatever you can afford for a period of 24 months or by donating online. All funds have been collected in a designated and restricted Mosque re-development account. Please present this appeal to your friends, family and work colleagues and request their assistance also. All respected donors are asked to stay updated with the projects progress online or by contacting the Centre. Please download the standing order here. Kindly hand in your standing order form at the Masjid office or post to the Masjid address as supplied above. Call the Masjid office on 020 8840 4140 and donate by debit or credit card.